In the bestselling tradition of Loving Frank and March comes a novel for anyone who loves Little Women. Millions of readers have fallen in love with Little Women. But how could Louisa May Alcott - who never had a romance - write so convincingly of love and heart-break without experiencing it herself? Deftly mixing fact and fiction, Kelly O'Connor McNees imagines a love affair that would threaten Louisa's writing career - and inspire the story of Jo and Laurie in Little Women. Stuck in small-town New Hampshire in 1855, Louisa finds herself torn between a love that takes her by surprise and her dream of independence as a writer in Boston. The choice she must make comes with a steep price that she will pay for the rest of her life. Normally, I hate the books that attempt to cram fiction into the lives of my favorite authors. I also hate the insulting implication that literary geniuses like Jane Austen and Louisa May Alcott must have had love affairs in order to write brilliantly about relationships between people -- as if these authors do not have enough skill, imagination, and observational power to write such stories on their own. 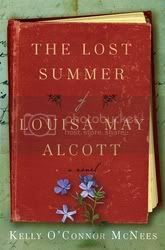 So, I was a bit nervous when I sat down to read Kelly O'Connor McNees' The Lost Summer of Louisa May Alcott. And I continued to be a little bit on edge as I read the first half -- as the author settled in to Louisa's mode of writing, as the circumstances of the novel unfolded through fade-in images that were half-familiar, as the persons with whom I had been acquainted through non-fiction became characters. In the end, however, after all that nervousness, and after a considerable period of "getting used to" the novel, I was pleasantly surprised by this book. McNees is incredibly respectful -- instead of twisting the facts as others have done, she has done her research and found an empty space in Alcott's life, one just the right size for a romance. The love interest she created for Alcott is not too much like Laurie (of Little Women fame) to be cloying, but has echoes of the character enough to allow us to see McNees' inspiration. The light hand and gentle tone of the writing echo -- again, respectfully -- Alcott's own, particularly in Little Women. It did take some getting used to, this approximation of another author's voice, but as I read I realized that it was necessary. Is this a great and lasting piece of literary genius? Probably not. But it is a sweet and tactful offering, from one Alcott fan to the others of us who have not been so bold as to take up the pen in imitation of our hero. Overall, well worth the read. I really liked Little Women, so this sounds like a fun read for me! Thanks for cheering for me on the read-a-thon! Looking forward to many more reviews, read-a-thons and book-related extravaganzas!